It has been just a day since my Auntie Joy died. I had to actually stop and think about that, because it seems like it has been such an eternity since I heard the news. But she feels so close. It’s almost as though I can close my eyes and see her. That is what I am feeling for my auntie’s second day in heaven. Then maybe some sight seeing later, getting acquainted, learning where everything is. It’s one of the advantages of outliving most of your generation, having such a party waiting for you, going to a place that is more full of people you love than the place you are leaving. Yet another reason why it is not fair for those who die young. If Michaela died in 1988, she would have had a few relatives waiting for her. She even wrote a note about it, which we just found a couple of years ago. 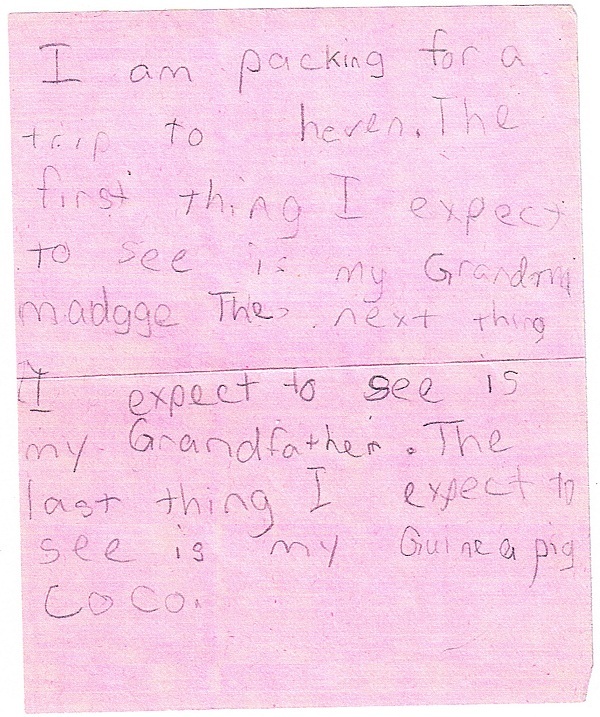 Her Grandma Madge, her Grandfather, even her guinea pigs. Others also that she didn’t know. My grandmother, my uncle, relatives even I don’t know. But she would have left the ones who loved her most behind. One of my friends, Chris, lost her daughter to a car accident when she was 17. Chris now works with other mothers who have lost their children. Angel mom, they are called. She was talking this morning about how many of them have developed cancer, including a few who are in their final days. Why is this happening, she wanted to know. Not one to state the obvious, I suggested that maybe they long so much for their lost children, they want to go to them. But they don’t want to die, she said. No, of course not, because probably they have children here still, people who need them. Who knows? Perhaps the children who have gone are longing for their mothers. I don’t know. I don’t know why I am talking. Most people fear death, at least somewhat. I keep insisting that I don’t. I will tell you that my only fear of death is of leaving those who need me … my children, my family, my dogs even. I keep thinking that besides the grief of separation, death would be a great adventure. But I guess it takes standing on the doorstep to really know how you feel. I keep being struck by the fact that I will never again be able to call my Auntie Joy and have a chat. I am really sad that I never got to visit her in these last few years. She invited me many times, but I just could never afford it, the combined expense of the trip plus missing the amount of work that would be necessary to have a real visit. I get a few days vacation a year on my job, but they are usually used up one at a time, to cover sick leave, to be able to see my daughter off to a prom, to attend events. I don’t have blocks of weeks left to travel. I keep thinking, though, that I should have found a way. I should have made a way. Let me tell you, everybody, everywhere, to remember that tomorrow is not always promised. Don’t put things off. Don’t create regrets you will live with forever.